On This Day in History, August 1, 1794, the Whiskey rebels gather to march on Pittsburgh at the height of the Whiskey Rebellion, a tax revolt that threatened to derail the early United States under the new US Constitution. Farmers on the frontier often operated small distilleries to supplement their incomes. Their grain was often converted to whiskey for easy transport across the Appalachians. Whiskey was often used as a form of payment on the frontier as well. This caused the prices of common items to rise, which disproportionately affected the poor. The tax affected western distillers more than it did eastern distillers, who were often much larger and could afford to pay the tax. Violence began to break out in 1791 when the government began establishing tax authorities in the frontier counties. Tax officials were tarred and feathered, had their homes vandalized and were threatened into resigning their positions at gunpoint. Those against the tax began to organize, form militia groups for resistance and even form their own "Congress." Matters came to a head in July, 1794, When a US Marshall began delivering subpoenas to distillers in western Pennsylvania who had not paid their taxes. Rebel militia surrounded the home of General John Neville, the tax inspector for western Pennsylvania, believing the marshall was there. Hundreds of militia surrounded Neville's home and a battle broke out with US Army officers at the home. The rebel leader was killed along with several others on each side. Neville's house was burned to the ground. Rebel leaders began to call for open rebellion at this point and a meeting convened on August 1 at Braddock's Field east of Pennsylvania. The most ardent advocated a march on Pittsburgh, the center of the whiskey tax's supporters, to loot and destroy the town. The residents of Pittsburgh calmed the crowd down by sending representatives to the gathering who agreed with the injustices being protested and offering to let the crowd march through the town peacefully, with free whiskey for all. This ameliorated the crowd's fury and the following day thousands of protestors marched through the town peacefully, burning only the barns of Major Abraham Kirkpatrick, the leader of the US Army soldiers at Neville's home. The march on Pittsburgh brought down the full wrath of the US government. Most of President George Washington's advisers believed the rebellion could only be put down by force. 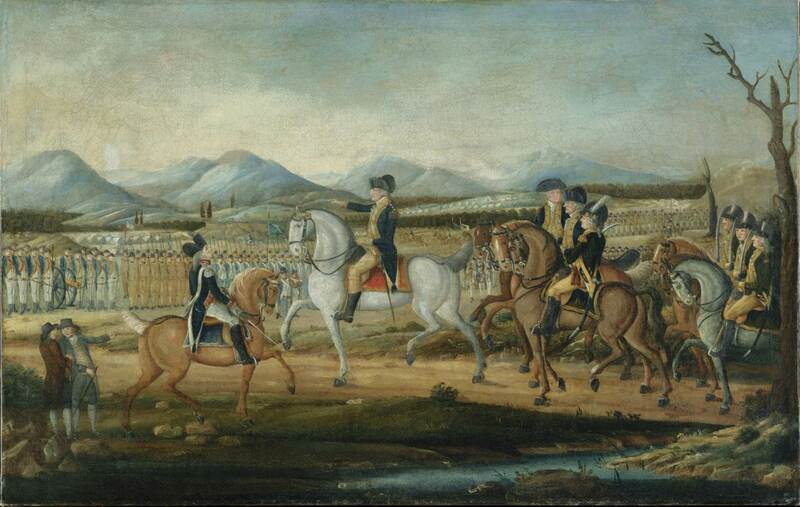 Washington ordered the militias of four states to gather and personally led 13,000 men toward western Pennsylvania. When they arrived, the rebellion quickly dissolved. Dozens of rebel leaders were rounded up, but few were ever prosecuted and only two were convicted. These were pardoned by Washington. The response to the Whiskey Rebellion proved that the new federal government had the power and the will to put down internal rebellion. It also helped establish the authority of the federal government on the western frontier and the notion that freedom of assembly and petitioning the government for redress of grievances were part of legitimate protest. The Whiskey Rebellion was also a catalyst for the development of the Democrat-Republican party of Thomas Jefferson, which pitted those who wanted a less powerful central government against the Federalist Party of George Washington and John Adams.